Since about 2005 I have attempted, gradually and without many pointers, to gain a decent overview of what has been happening in the Australian-based improvised music scene. As I indicated, this has been largely an autodidactic search, the catalyst being my discovery of Will Guthrie’s music in 2004. Few music writers readily accessible to U.S. readers, outside of Brian Olewnick and, especially, Jon Dale, have consistently reported on the fecund and fertile scope of activities there. I’ve become convinced there is an ethos bred in the Aussie bone that suffers no fealty to genre nor ideology, as many of the musicians I enjoy from Oz have been engaged for years with organizing and performing in festivals and venues, in groupings and configurations, that create the occasion for the collision of noise, psychedelic, contemporary classical, field recording-based and freely improvised music. This obtains in discussions I’ve had with erstwhile Australian musicians, now scattered to Nantes and Tokyo and beyond, a refreshing rejection of any area of music’s primacy, a genuine communitarian approach. Anthony Guerra is such an itinerant, moving from Sydney to London to Tokyo over the last decade or so, developing his approach to prepared and conventional guitars, an impressive crew of playing partners, his own imprint for documenting whatever grabs his interest, and not a few monikers for these various working projects; my sample of Guerra-related projects released solely on his Black Petal imprint necessitated my sorting out Paper Wings, Green Blossoms and Geodesic Domes On The Horizon. 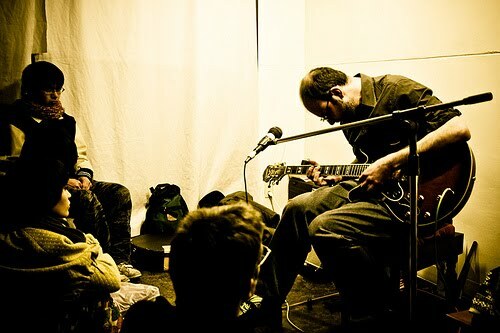 Guerra additionally performs as Broken Hands [his duo with Michael Rodgers], overall creating an array of what Portuguese poet Pessoa called heteronyms, authorial personae. As with Pessoa’s various poetic noms, published under the names Caeiro, Reis and de Campos, the character of the work issued under the names Guerra uses varies significantly, while retaining a distinct center. Guerra has played guitar since a teen. In 1999, he began to explore, initially via the forum of drummer Eddie Prevost’s workshops, the ripening field of London-based improvisation. Guerra collaborated with many players over the ensuing several years, formed the Two Thousand And imprint with Michael Rodgers, and documented some fantastic music on the Impermanent and Pseudoarcana labels, among others. Apropos of this blog, his duo with Antony Milton, Paper Wings, had an extended track on a compilation entitled Crows of the World. Guerra launched Black Petal in 2005 upon settling in Tokyo, and the catalog is currently at 31 releases [some out of print]. Black Petal #1 is entitled Empty Kingdoms, a solo guitar offering from Guerra as desolate and spare as the title suggests. A self-described “loner blues”, with laconic guitar lines at times reminiscent of Loren Connors, lattices of mournful guitar melodies, and singing that is equal parts moan and murmur [the vocals are both wordless and lyric-based, and are mixed as if wailed from an adjoining room in a bleak motel], Empty Kingdoms clearly was occasioned by a period of tough sledding in Guerra’s life. With this uncompromising, lovely downer anchoring the catalog, the ensuing five years include releases of coarse, ear-abrading feedback squalls, squeezing every possible striation of noise from a single, held tone [Peter Blamey, a.k.a Geodesic Domes On The Horizon’s Feather of a Bee], another melancholic, hermetic solo guitar release, this one from simpatico partner Michael Rodgers [Curtained Moon], and two of Guerra’s duo projects, one with Antony Milton [Paper Wing’s Ash Field], the other with Mark Sadgrove, entitled Iron Sand. So what is this center I suggest is present throughout Guerra’s varying projects? His playing is pretty consistently tonal, melodic, sparse and darkly hued, whether in tandem or solo. This, of course, describes the most obvious antecedent to Guerra’s sound world, guitarist Loren Connors. Guerra, however, has a couple of distinct qualities that seem equally pervasive, perhaps signature. It is difficult to articulate one aspect of his playing I hear almost recklessly loosed in Empty Kingdoms, and laced throughout the collaborative works as well- it is a sort of intentional tangential quality, a wandering, drifting feeling, superficially sounding a little like slack jamming, but upon repeated listens, is heard as a focused and deliberate allowance for tangent and drift. I am full aware how this conveys an oxymoron, when in fact it is the paradoxical nature of Guerra’s best work. Wisps and billows of guitar clouds within which Guerra places spare notes shaped with a touch that brings to mind the very old east Indian ideal for string and sound quality- “not too slack, not too tight.” Haino comes to mind at times, but more than any other referents, I realized Guerra’s approach on the quieter works is reminiscent for me of an American guitarist probably on few of the radars for this area of music, David Lindley- specifically the Lindley of the soundtrack work of The Indian Runner and, especially, Paris, Texas. The same sort of loose, sometimes plangent, pawn shop filigree roots music. Guerra is strikingly without pretension and artifice, even in beautifully complex, detailed work like his duo with Joel Stern, Outside Bowers [search this one out]. This absence of affectation manifests in his materials, sound choices, and partnerships. Mention must be made of Michael Rodgers’ Curtained Moon, a release that shares with much of Guerra’s stuff that sense of a very relaxed and ventilated improvisation- this one literally recorded with windows tossed open, through which you may hear wind, chimes, street murmur and other framing ambient sounds that perfectly underscore how indelibly lonesome Curtained Moon sounds. It is like an audio journal of a very specific moment and mood [and malaise], Rodgers worrying guitar lines and skeins that frequently splinter and flare, fitfully stop and start, gain steam and as abruptly halt. It is almost unnervingly intimate, warts and flaws intact, and by its conclusion, beautifully enveloping. I needed multiple listens to get past the uncharacteristic raw spontaneity, the seemingly flubbed lines and abandoned ideas Rodgers seems to skitter through, as if, like this listener, he was distracted and derailed, but determined to make his guitar sing. Lastly, a word about Green Blossoms, Guerra’s duo with vocalist and ukulele player Aiko Koga. Their release, Whiskey Leaves, is on the Digitalis label, the only one in this batch not on Black Petal. It is goofily bright, happy folk-pop, with simple, braided guitar, ukulele and percussion supporting Koga’s tuneful vocals. It sounds like something I could hear a few times and be done with, a pleasant confection for an occasional mood. Alas, I was hooked from the get, and have played Whiskey Leaves over and over, cheered especially by its presence in a clutch of releases that can dose you into a state of tener duende sufficient to paste you to your chair for a spell. I love this record and hope Guerra and Koga see fit to release another. The attention and acute eye Guerra brings to the Black Petal packaging is lovely, if a bit vexing. Each one is constructed of high quality paper stock, apposite graphics, and a design style akin to wabi sabi. The vexing aspect is getting the damn discs out of the beautiful packages. I sense Guerra may actually enjoy a bit the extraordinary attention the listener must bring to retrieving the disc for play. It is a considerable haul from the desolation of Empty Kingdoms to the sprightly tunes of Whiskey Leaves, a trajectory that limns nicely Guerra’s musical sensibility and sound. He is consistently idiosyncratic, engagingly imprecise, and apparently allergic to flash and artifice. I suggest you dip into his sobering and dolorous sound world, holding Whiskey Leaves at the ready, medicine for whatever else troubles you. This entry was posted in music writing on April 20, 2010 by jessewgoin.